Loving Your Process – Love. Life. Practice. Yesterday I had an eep moment. The idea is that every month she interviews a “Rockstar” of the lettering/visual practice world, and you (the student) get the chance to ask the guests directly for input (or, if you miss the live broadcast, you get to see the re-broadcast). But…I’m new at this. I’ve probably practiced it for about an hour, tops. Sure, I’m trying to put it into practice wherever I can…but in spite of the tremendous confidence granted to me by a world literally designed for my convenience, I’m not that good at it yet. I also am a firm believer in documenting your own process, and sharing the challenges and progression, which is why my Instagram for CreativeGrayVisual exists. There’s a thriving community of letterers, visual recorders & facilitators, and sketchnoters on the platform, and it’s inspirational and makes me feel a part of this community. 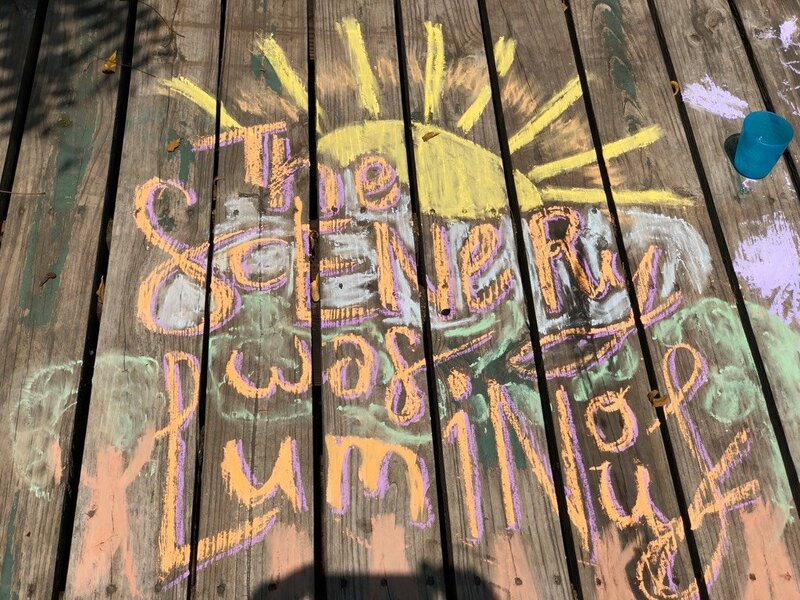 Yesterday my friends’ daughter (who we’re watching, along with her siblings, while their parents enjoy a well-deserved vacation) invited me outside to do chalk drawings with her. I seized the opportunity with perhaps more gusto than was warranted, resulting in the image you see above (in case you’re wondering, it’s half of a quote from Full Metal Alchemist: Brotherhood, and no, I was not about to put the second part of the quote on my friends’ porch). Dutifully, I took a picture and posted it to Instagram, making a joke about being “Bert from Mary Poppins” and of course giving credit for the inspiration and style to Corinna Keeling. Of course, she saw it. And she commented back: Swoon! Not “Good job.Not “Keep it up”. ” Not “That’s an interesting start to a possibly legible style.” No, that was not just praise, it was praise that made me blush. And instantly, the voices were in my head: Of course she said that, it’s social media, she’s protecting her brand. You know it’s a smudgy mess. She’s really laughing and showing her friends just how ridiculous that old guy in flyover country is to think he can emulate her style. But I confess, the pantry is pretty damn full. I can see all the things I wish were better about that drawing, and at the same time I can see things that I really like about it. The challenge is to extend to myself and my early work the same love and compassion I would share with others – while at the same time keeping myself uncomfortable enough to stay in that zone of Deliberate Practice. I like the piece. I love lettering, and creating things with my hands in a way that I’ve not done much of in my life. It’s not a matter of whether I love the things when I’m doing them. The challenge is to love them when they’re done, even if they are imperfect, and even if – or perhaps because they are helpful signposts showing me the direction I need to go.